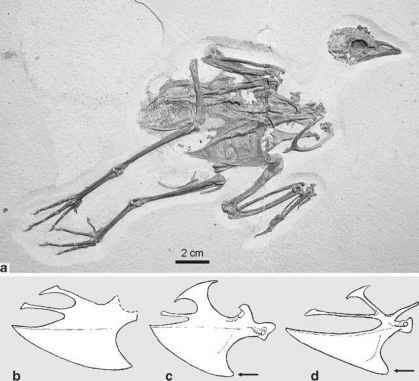 This distinctive group of early Paleogene palaeognathous birds was reported from the middle Eocene of the Geisel Valley and Messel in Germany (Houde and Haubold 1987; Peters 1988b). The single species included in the taxon Palaeotis weigelti Lambrecht, 1928 was originally described as a bustard (Otididae) by Lambrecht (1928). Houde (1986) recognized its ratite affinities, which were further substantiated by Houde and Haubold (1987). P. weigelti is known from articulated skeletons and had a standing height of slightly less than 1 m. Its palaeognathous affinities can be unambiguously established by the morphology of the palate (Houde and Haubold 1987). P. weigelti was a long-legged, flightless bird, which certainly had cursorial habits, although it lived in a forested paleoenvironment. The species is distinguished from the Lithornithidae and shares with the Struthionidae, Rheidae, and Casuariidae caudally projecting supraorbital processes on the skull, the loss of a sternal keel, a scapulocoracoid, a bilaterally compressed pelvis, and the lack of a hallux. It has a narrower beak than all extant ratites except cassowaries (Casuariinae). As in extant Struthionidae and Rheidae, the humerus and ulna are fairly long, whereas the wing skeleton is much more reduced in the Casuariidae, Apterygidae, and Dinornithidae (Peters 1988b). In contrast to that of all extant ratites, the tarsometatarsus of Palaeotis further exhibits deep furrows along the midlines of its dorsal and ventral surfaces, which give the bone an almost H-shaped cross section (Fig. 5.2; Mayr 2002a). The proximal phalanx of the second pedal digit bears a proximally directing process, which led Lambrecht (1928) to assume a ground-scratching habit for Palaeotis. The relationships between Palaeotis and other palaeognathous birds are not well understood. The presence of well-developed supraorbital processes and a scapulo-coracoid, as well as the reduction of the sternal carina and loss of the hallux support a position within a clade including the Struthionidae, Rheidae, and Casuariidae. As noted above, such a clade is, however, not obtained in molecular analyses, which casts some doubt on the phylogenetic significance of these shared morphological characteristics. Whereas Houde (1986) and Houde and Haubold (1987) considered a sister group relationship between the Palaeotididae and Struthionidae, Peters (1988b) assumed a sister group relationship to the Rheidae. Mainly owing to the limited osteological information available from the specimens, the evidence for either hypothesis is ambiguous. An analysis by Dyke (2003a) resulted in a sister group relationship between Palaeotis and a clade including the Struthionidae, Rheidae, and Casuariidae.